Realizing the Promise of Precision Medicine: The Role of Patient Data, Mobile Technology, and Consumer Engagement explains the potential of personalized medicine and the value of those approaches in making that potential a reality. The book helps transform one-size-fits-all healthcare into a system that focuses on individual needs and the unique needs of each family member, discussing topics such as U.S. sponsored precision medicine initiative, genomics, the role of electronic health records and mobile medicine, patient engagement and empowerment, health information exchange and patient data protection. In addition, the book discusses the barriers and limitations of precision medicine and how to overcome them. Readers will find valuable insights into how big data, patient engagement, mobile technology, and genomics help individualize medical care and offer a pathway to help detect many undiscovered causes of diseases. Paul Cerrato, MA, has had over 30 years of experience working in healthcare, as a clinician, researcher, author, editor, and college lecturer. The last 7 years have been spent researching and writing about healthcare technology. He has served as Editor of Information Week Healthcare, Executive Editor of Contemporary OB/GYN, and Senior Editor of RN Magazine. 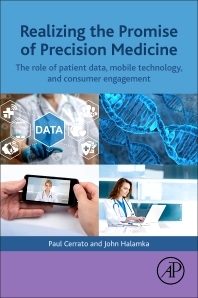 Cerrato is the author of Protecting Patient Information and the co-author with John Halamka of Realizing the Promise of Precision Medicine. He has been named one of the most influential bloggers in healthcare IT by the Healthcare Information and Management Systems Society (HIMSS). John Halamka, MD, serves as the International Healthcare Innovation Professor at Harvard Medical School. He is also Chief Information Officer of the Beth Israel Deaconess System and a practicing emergency physician. Dr. Halamka serves on one of the advisory committees for the Precision Medicine Initiative, which has been funded with $215 million from the U.S. government. He has devoted his career to empowering patients, providers, and payers with mobile-friendly applications exchanging data using international standards. An inspiring and informative introduction to the potential of precision medicine—and what it means for clinicians and HIT professionals on the practical level. The book discusses genomics, the expanding role of technology in healthcare, and the federal Precision Medicine Initiative, offering a roadmap for connecting emerging technologies and large-scale datasets to develop and customize better prevention and treatment methods. An inspiring and informative introduction to the potential of precision medicine—and what it means for clinicians and HIT professionals at the practical level. The book discusses genomics, the expanding role of technology in healthcare, and the Precision Medicine Initiative, offering a roadmap for connecting emerging technologies and large-scale datasets to develop and customize better prevention and treatment methods.